In reflecting on the deep and abiding mystery of the Trinity, some of the truths that we are brought to is that communion with others is always possible, that this communion is necessary and that it is free, although it does take work. Communion is always possible because the very Creator of all is a communion of persons – eternally abiding in love and self-giving. This should not be written off as a nice, superficial thought but rather it should be recognized for what it is – a fundamental anthropological and societal truth that does make authentic and abiding claims on life and reality. Communion is always necessary because without it we are less. We are not meant to live isolated lives. Communion is free and this is much to chagrin of the market-place and the economy of consumption. Many voices in our time proclaim the opposite. “Be a self-made man or woman!” “Pull yourself up by your own bootstraps!” “It is you against the world.” “Fear the other and set up walls to protect and keep out!” This thought has even found its way into the sphere of Christianity in the emphasizing of a “Jesus and I” approach to faith. Church and community is nice but it is not really all that necessary. Now it seems that even the acknowledgement afforded by history to the unique status and communion of marriage and family is being discarded as dynamics in contemporary society seek to reshape family more in terms of what “I want” and “my right” rather than in the life-giving reality of self-gift as laid out in the basic biological blueprint of creation itself. All this leads to an increasingly isolated existence which plays to the benefit of an economy of consumption. My personal theory is that we are now living in a time when it is the economy with all the pressures at its disposal attempting to shape us in its image rather than us shaping the economy in our image. To wit – an isolated, self-focused individual trained to view reality through the prism of “I want” is potentially a much better consumer than one who is connected with other people in life-giving ways that are beyond the power of the market-place (i.e. family and individuals living authentic and honest relationships). The economy of consumption wants an upgrade to family and existence in general. A “2.0 family” as it were. Family defined by self-gift and sacrifice is no longer good enough. Family defined by want and individuals who are increasingly isolated is now what is needed to keep the economy humming! In the Holy Trinity we are shown a different economy – not an economy of consumption but an economy of self-gift and we find it revealed that this economy is not only at the foundation of all creation but is the source, itself, of all creation and life. 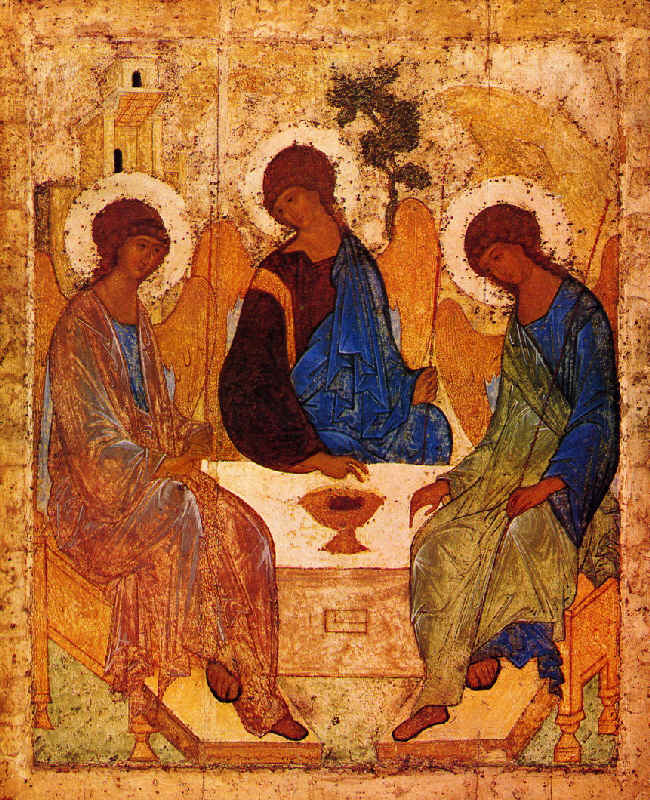 Notice how the three Persons of the Trinity freely receive from one another and freely give to one another. Notice how this gift of self does not diminish each of the Divine Persons in uniqueness but actually fulfills each of the Persons. The Father is not lessened by the Son receiving all the Father has to offer nor are the Father and Son diminished by the Spirit taking what they offer one another and declaring it to us. Self-gift does not need to be feared because it leads to the fulfillment of personhood and life and not to a loss of self! As Christians, we strive for the truth of being, even when we fail individually and communally we still strive by God’s grace. The economy of consumption is not our economy. We are meant for so much more! Peace … Endurance … Proven Character … Hope … Love of God. These are all the gifts of the economy of self-gift. Not a bad list, when you think about it.